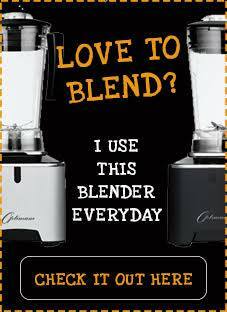 I am always up for trying out new flavours and combinations. I am currently trying to do a lot of meat replacement meals and that means experimenting with various vegetarian recipe ideas. This recipe is something that happened on a lazy Sunday afternoon with whatever ingredients I could lay my hands on. Sunday was a very busy day for me and in spite of all my good intentions, to spend the entire day lounging around in my p.j’s, watching the telly with my feet up… I had so much cleaning to do and the week ahead to prepare for, that at the end of the day all I wanted to do was crash and get some shut eye. I did fall asleep on the sofa with my laptop dangling at a dangerous angel, the telly still on and I was probably drooling and maybe even snoring. Not a pretty sight! So I was thankful that I managed to get lunch on the table in a matter of minutes in spite of so much going on. This was a very mix and match kind of a meal using some store cupboard essentials and a pack of frozen veggie sausages. I was honestly very relieved to find those sausages as they really managed to add bulk to the pizza. I also managed to find two jars of pasta sauces which are near expiry! I hate having to bin things which just live in my cupboard and expire. Genius GF pizza bases are great for creating a whole host of toppings for their crispy crusts and chewy centres. They also are great when paired with chilled Celia beer. 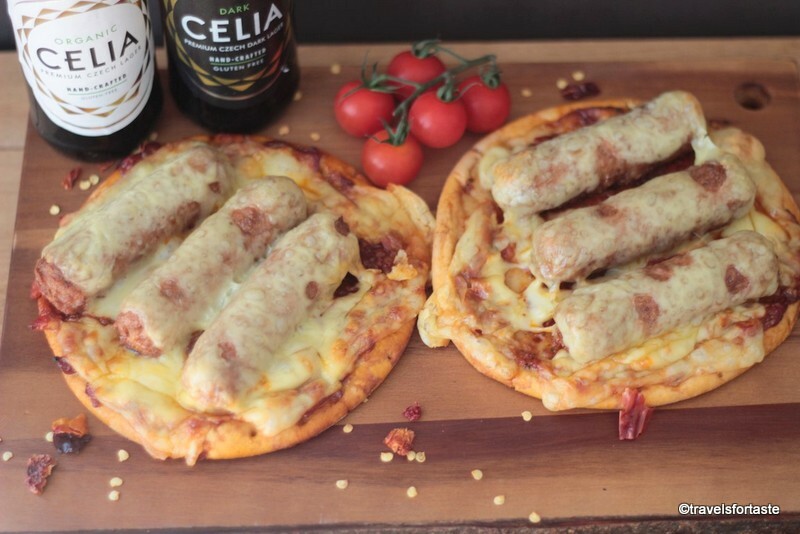 Right now, Celia has teamed up with Genius and and Ocado for a limited time offer until 15th March’16 where you get a lager + pizza/pitta for only £5. Why not buy this delicious GF organic lager and the pizza base or pitta while on offer and stock up? The Genius pizza base and pitta are suitable for home freezing. Perfect for when you want a pizza and beer night in with friends and family and a great way to get creative with your toppings or get little ones to pitch in creating the toppings too. 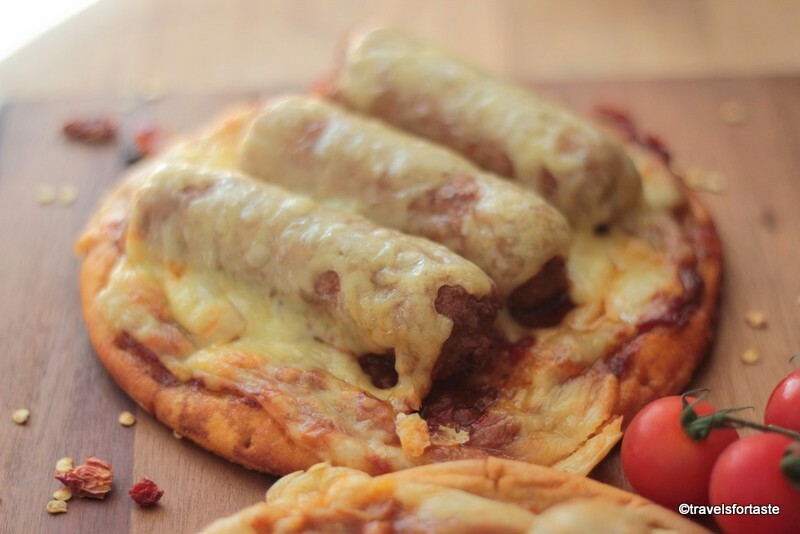 Gluten free pizza with vegetarian sausages - get creative with your toppings! 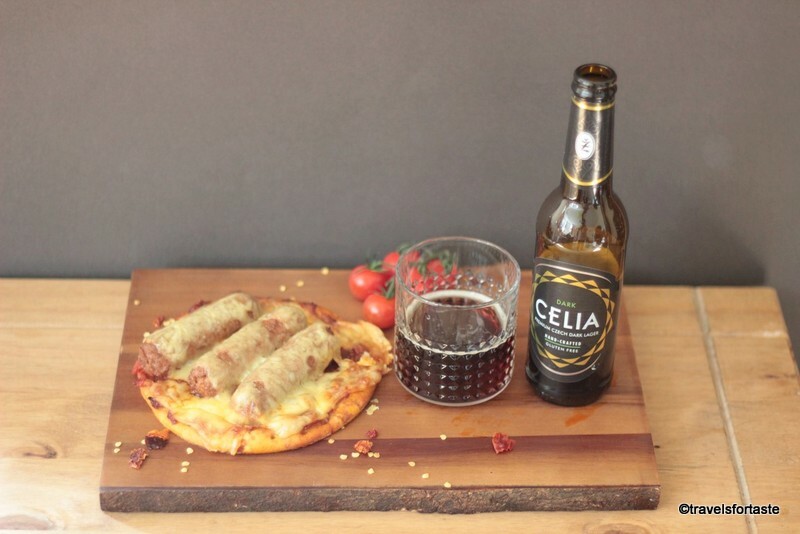 Serve hot with chilled X2 CELIA Organic lager or X2 CELIA dark lager. I personally prefer the light lager while hubster prefers the dark lager but whatever suits your taste the best. And if you wish to swap Emmental for a vegetarian or vegan option feel free to do so, though I do wonder how it would affect the taste. The sausages I used are vegetarian and very delicious and currently my favourite. The GF pizza base has a distinct flavour of its own, very different from the normal pizza bases we have used in the past but this is a taste that can definitely grow on us and we are not complaining at all. 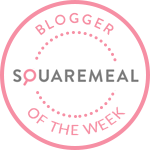 This recipe idea is perfect for meat-free Mondays so am linking up with Meat Free Mondays hosted by Jacqueline of Tinned Tomatoes. Also this recipe is also a great way to use up leftovers and create toppings from store cupboard essentials so am linking up with #CreditCrunchMunch which I am guest hosting for this month for Camilla who blogs at Fab Food 4 All and Helen who blogs at Fuss Free Flavours, that makes this recipe also a great fit for #NoWasteFoodChallenge hosted by Elizabeth of Elizabeths Kitchen diary. *With thanks to Foodies100, Celia Lager and Genius Gluten free for sending me samples to review. The offer at Ocado is for a limited period and ends 15th March’16 – any queries related to offer to be directed to Celia directly. No monetary compensation was offered for a positive review. As always all opinions expressed here are entirely my own. 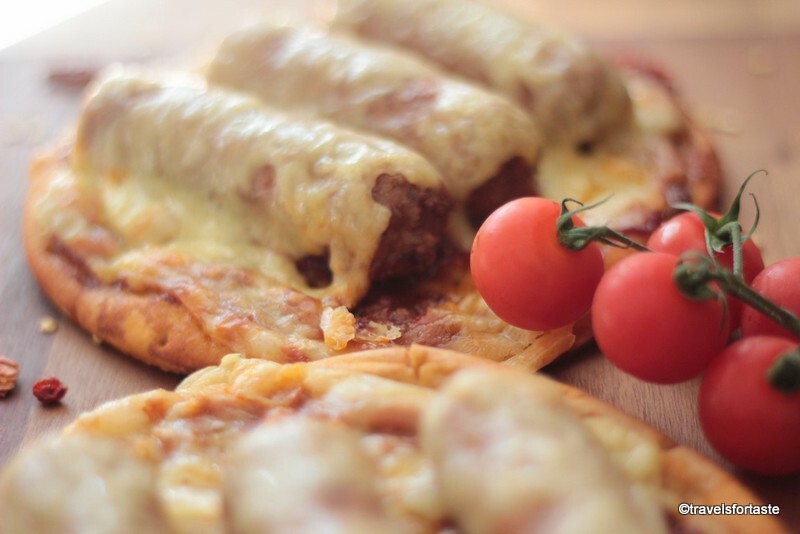 When hard pressed for time, frozen pizza base and frozen veggie sausages come to the rescue. Thanks for letting me host the linky!